Each year, over 100 senior officers from over 60 different countries attend the National Defense University to obtain their Master’s degree from the Eisenhower School, the National War College, and the Center for International Security Affairs. The Sponsorship Program helps these senior officers adjust to and enjoy their time in the United States. Being a sponsor is not designed to be an interruption but rather an integration into your normal schedule. As a sponsor, you are not required to set up special functions for your international guest, but to include the officer in the things you and your family does normally. It is not a financial commitment. Community sponsors act as fireside diplomats, and have the opportunity to participate in a vital American foreign policy initiative. Volunteers are matched with an officer, and act as a cultural guide and friend to the officer- putting American society and culture on display through their interactions. If you would like to learn more about the opportunity or for an application, please contact Casey Vaughn at casey.t.vaughn.civ@ndu.edu or call (202) 685-4240. Click the image above to download the program flyer. 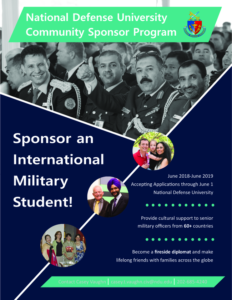 Applications accepted through JUNE 1, 2018 for sponsorship June 2018-2019.